Long, boring videos are out. Mini videos are so in. Instagram has a new tool called Boomerang for taking short videos that play forwards and then backwards. It can capture the silent videos on the front or back camera. The app works best if there is a dramatic movement. Examples of good subjects include a person blowing a bubble or someone jumping off a diving board. Of course, silly selfies can only be enhanced with video that goes forward and backward. Boomerang joins Apple's (AAPL) Live Photos, Twitter's (TWTR) Vine, Instagram's own 15-second videos and good old GIFs in the booming tiny video category. One reason might be that shorter videos are a better fit for social media than the longer clips that fill YouTube. Boomerang's final 4-second masterpiece is saved as an easily sharable .mov file. Boomerang is the third single-feature, stand-alone app from Instagram. 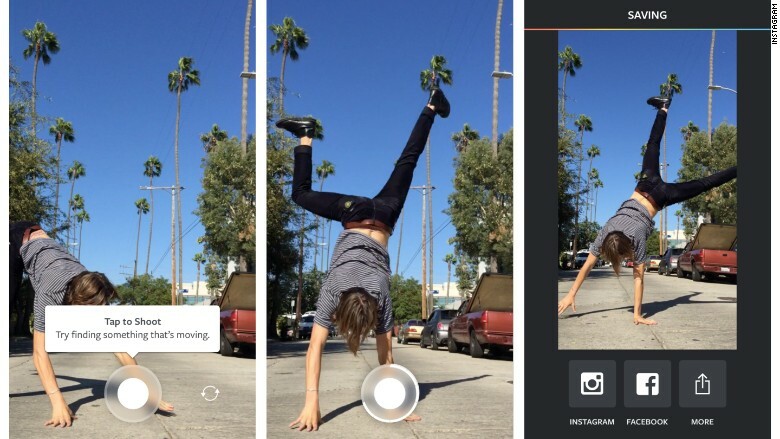 Free for iOS and Android, it joins Instagram's time-lapse app Hyperlapse and collage app Layout. Instead of adding additional features to Instagram itself, the Facebook (FB)-owned company has been spinning these more experimental tools off as individual apps. While it keeps the main app from being bogged down with options, it does contribute to app clutter.